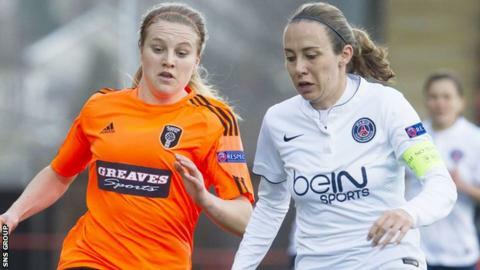 Glasgow City's Fiona Brown says Chelsea will be difficult Champions League opponents but the striker is looking forward to the last 32 tie. Seeded eighth after last season's run to the quarter-finals, the Scots have been paired with the Super League leaders and FA Cup holders. "I think for two British teams to be drawn together - that can only be a good thing," Brown told BBC Scotland. "Chelsea have got five or six players who were in the World Cup in Canada." City lost 2-0 at home to Chelsea in a February friendly a month before their Champions League exit at the hands of Paris Saint Germain. Although soundly beaten 7-0 on aggregate by the big-spending French side, 20-year-old Brown enjoyed being part of the best European run by a Scottish side. "Last season was amazing," she told BBC Radio Scotland's Sportsound. "We kind of overachieved as a club, but the draw this season is just as exciting. "Chelsea are definitely full of internationals; a lot of the English girls are there and they've proven themselves last year in the Super League. "Again this year, they're sitting top. Although they're debutants in the competition, I think they're deserving of their place. They'll be a tough team." Chasing a fourth domestic treble, City changed managers midway through this campaign as Scott Booth replaced Eddie Wolecki Black. "Scott's come in and the club's a really happy place," explained Brown. "It's been really quite smooth considering it's quite a big thing to have a new manager coming in half way through the season."